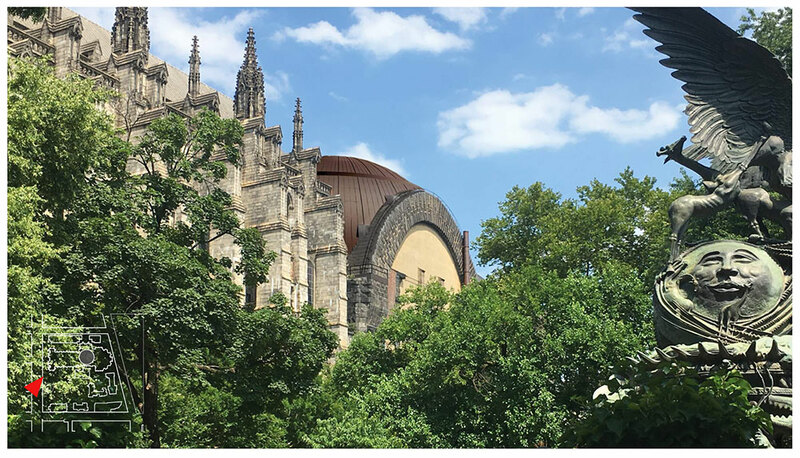 This week New York City’s Landmarks Preservation Commission will consider proposals to help preserve and rehabilitate the massive, vaulted dome ceiling of The Cathedral Church of St. John the Divine. If approved, the structure’s existing granite dome would be encased by a bronze-hued copper enclosure. Located at 1047 Amsterdam Avenue in Morningside Heights, the Church of St. John the Divine is one of the most recognized religious structures in the United States and one of the largest cathedrals in the world. The crossing’s dome, originally intended as a temporary roof, was built and designed by Rafael Guastavino in 1909. Since that time, portions of the ceiling have experienced water damage caused by a deterioration of the structure’s waterproofing membrane and foamglass insulation. As a solution, Ennead Architects has proposed the assembly of a new roofing membrane above the existing granite structure and lower portions of the roof. 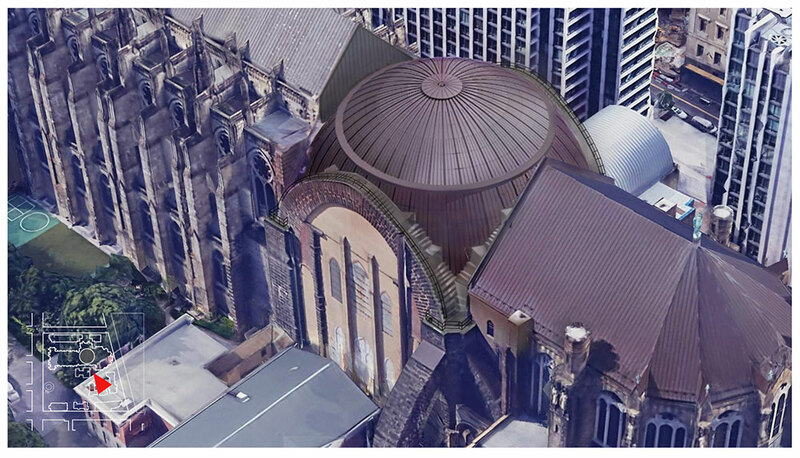 The proposed copper material would enclose the entire exterior of the dome. The proposals also include the replacement of an existing guard booth at the southern boundary of the site. The Cathedral Church of St. John the Divine officially opened its doors in 1941, and serves as the seat of the Episcopal Diocese of New York. 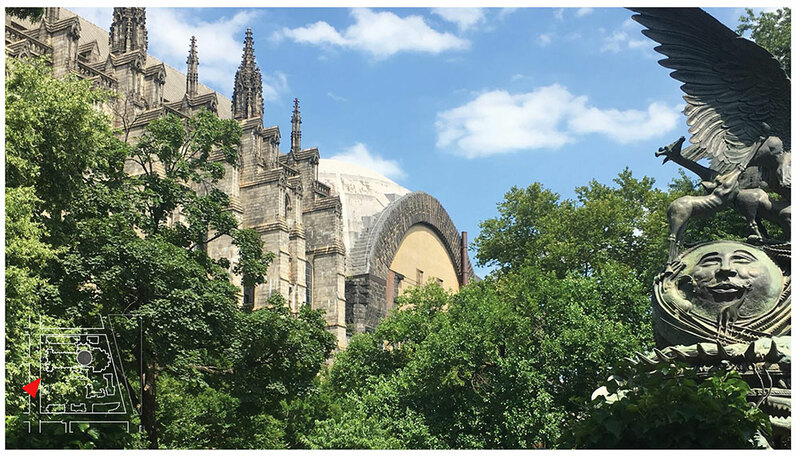 In conjunction with the designation of the Morningside Heights Historic District, the Cathedral was unanimously named a significant architectural landmark in 2017. A public hearing for this phase of alterations will take place on March 26, 2019. 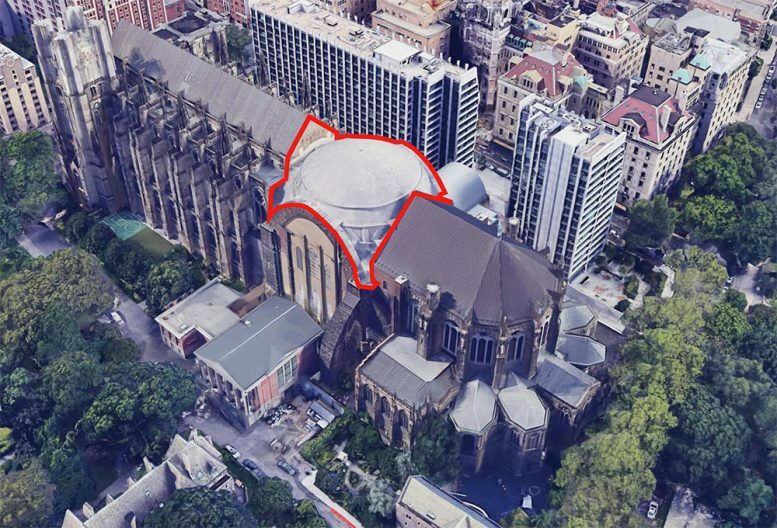 6 Comments on "Copper Dome Proposed for St. John the Divine Heads to Landmarks for Approval"
Whatever that guard booth is, it is clearly not a proposal for St. John the Divine. It is a random booth in a random suburban parking lot in some random suburban wasteland. If YIMBY aspires to be anything other than a mouthpiece for developers, you really need to get writers who know what they’re writing about. This being YIMBY, I’m kind of surprised they aren’t arguing that the cathedral should have a super tall glass box grafted onto it as a kind of modern-age spire – perhaps even the second tallest such thing in the Western Hemisphere. All of these images and not one showing what the intended cathedral is supposed to look like? Everybody relax. I’m guessing that they plan to build the same guard booth, but in Manhattan. Of course they can afford this now that they have raped the neighborhood with those absolutely hideous rental buildings they erected with the highest bidder. And I’ll bet those guard booths are popular in Boca. I have lived on Morningside Heights for 57 years, attended Columbia back in the ’60’s, acquired in 1971 and still reside in a co-op referred to as Morningside Gardens at the northern outpost of the neighborhood, and my deceased partner’s ashes are inurnated in a niche in the columbarium that occupies two of the Cathedral’s ambulatory chapels. In good weather I frequently walk down to the Cathedral Close to sit and read in one of the pergolas in the Biblical Garden and enjoy the presence of the peahen and peacock. With regard to the proposed replacement guard booth, it’s incorrectly sited to control vehicular access and egress to and from the extensive Cathedral grounds, and is somewhat derelict. 2) The two apartment buildings on the Cathedral’s grounds were built to generate desperately needed income for upkeep of a large, aging and intricate complex of buildings of which the Cathedral itself is but one situated on a three city-block site open to the public gratis. It would be well to recall that, traditionally, cathedrals have been the centerpieces of dense urban complexes and, historically, since as early as the late fifth and sixth centuries of Western Christianity have, most of the time, been tightly enclosed within the surrounding urban fabric. It is only beginning in he nineteenth century, under the guise of several types of rethinking of the proper appearance and use of the central cores of important cities of Western culture that cathedrals began to be thought of as “monuments” in a new sense. St John the Divine is a product of what is known as the City Beautiful movement, a nearly uniquely late nineteenth/early twentieth century development in the United States. There are parallels in other countries, but the impulses undergirding that movement here sprang from roots somewhat unique. 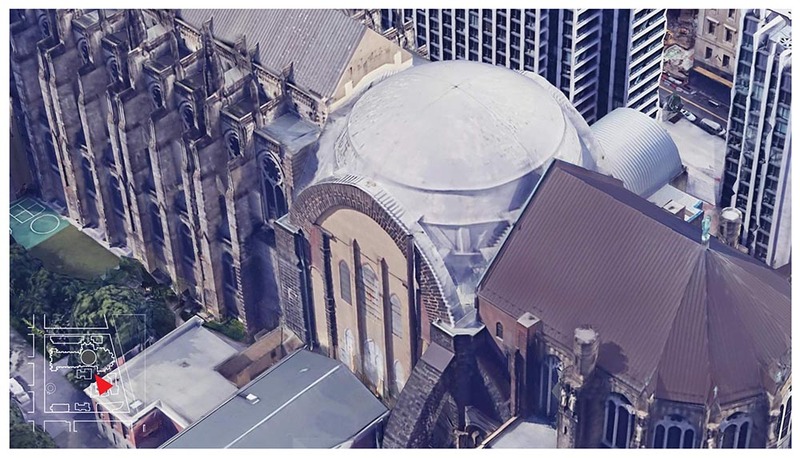 3) The Cathedral’s dome is one of the Guastovinos’—father and son’s–masterpieces, along with George Washington’s extraordinary residence in Ashville, N.C. Intended to be temporary, it has proved as durable as much else of the Guastavino oeuvre. Another example of their work in NYC–and there are many–is the vaulted ceiling of the Oyster Bar in Grand Central. It is unsurprising that a structure more than 100 years old, and now proposed to be recognized as permanent, should have, for the first time, a proper roof, and the copper enclosure will be both a fitting solution to an increasing problem, and will be an esthetic triumph. Were the traditional treatment permitted, it would be lead. So, come up to Morningside Heights, and enjoy and be awe-struck.